ABS enclosed, industry valve housing and metal aluminum frame etc, all of these parts features are very complex in design and construction, Take a look at this article, we will take one example to share the PC connector parts machined process to you. The most challenge is what connector parts CNC machining manufacturing? 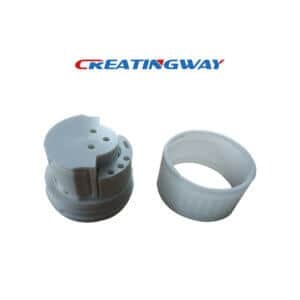 Two PC connectors and assembled parts of design purposed is to connect whole medical device under environmental protection, with rigidity and insulativity as well as abrasion resistance. As usual, like these complex feature we have further considered to use 3D printing with SLA process to save cost. To be honest, we have also produced this two parts with SLA printing at first time, but when we have tested its function and strength, the affect is not so good, so we have to use CNC machining process. The main difficulty are outside feature complex and up and down two holes is not a straight line, just middle running to connect two holes, this is great difficulty, and up hole size is 4mm, down hole size is 3mm, very small, so whole the precision machining process requirement is very high. Secondary finishing process such as anodizing, power coating, painting, Alodine, PFTE coating etc. 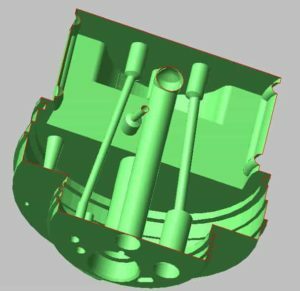 How to develop and machining the complex medical connector parts? All of medical parts ask raw material must comply with ROHS, FDA certificated, and some of electronic medical devices asks PC or POM material to machining their components due to parts weight, material performance better than metal material. All of plastic materials from white PC and POM, a few material are 2017 aluminum. 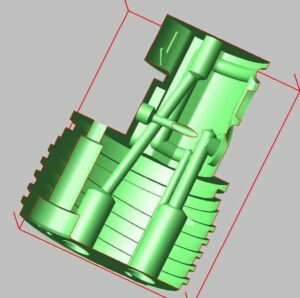 Further using 3D programme to simulate machining process to reduce risk. Set up the after machining process included polishing, cleaning up. Set up good machining process and inspection standard. The below is customer’s feedback and comments on our services, we have help him to realize whole product design and production. We own good technology and experience to achieve more challenge even some of impossible case. We will do next low-volume production, we believes that this will be more perfect and smooth. 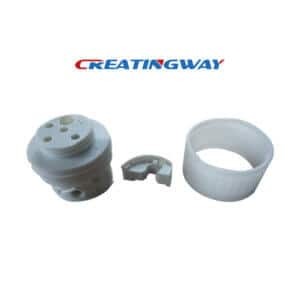 Creatingway is focus on rapid manufacturing, prototype, low-volume production services for various industries. Today, we have completed this PC connector parts CNC machining, of course, we also can help you to develop and manufacturing the others materials range from PMMA, Nylon plastic material to aluminum metal materials, to do cost reduction and production solution, make to be your one-stop manufacturer.